The first of March. February, gosh, February, what a month. The weather went from deep freeze to being almost able to wear t-shirts. Only almost. I've never become quite British enough that I start stripping the moment the sun comes out... But I hardly got into the garden or down to the allotment. 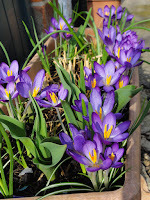 Between my two engaging but very busy long-hours freelance jobs, being ill for a week with a flu-virus and then having my back play up, well, you can see that I barely had a chance to garden, let alone blog. 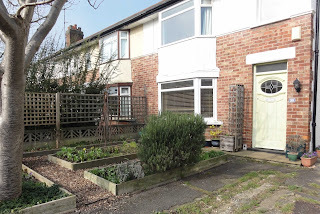 I did finally get into the garden for a short time last Sunday, and did some tidying up at the front, getting rid of anything damaged by the hard frosts from earlier in February and pulling up weeds that have suddenly sprouted in the warmer latter part of February. If you compare the top photo to those from 1st February, it doesn't look a lot different. But there are some subtle changes. The spring flowers are awakening. Today started deeply foggy but by lunchtime it burned off and the sun shone. 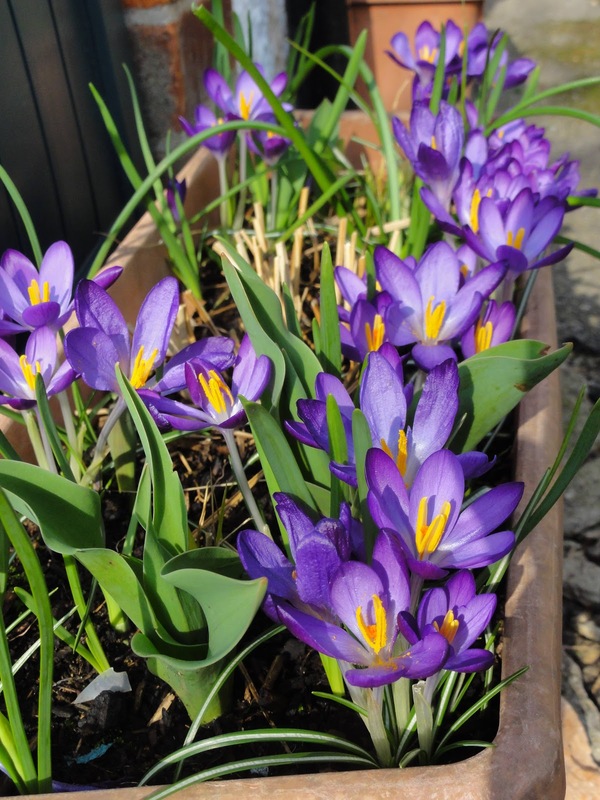 And in the sun the beautiful crocus 'Whitewell Purple' simply sparkled. 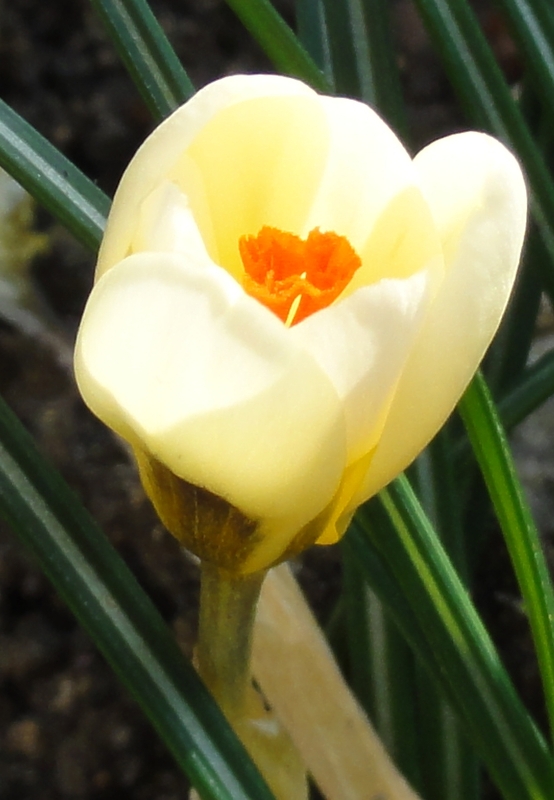 This is probably my favourite crocus. 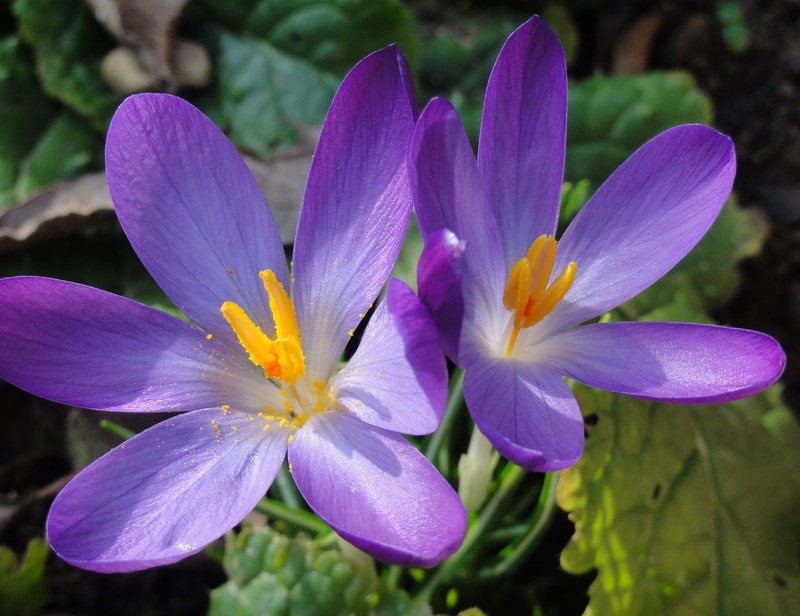 It has the most delicate silky purple-blue to mauve petals that glimmer in the sun. The orange of the stamen matches perfectly. It closes in the dark or on cloudy days, then bursts open the moment the sun peeks from behind a cloud. What's more, they are one of the easiest to grow, you don't need a whiff of experience, and they'll happily self seed in abundance, giving you more beauty each year. As you can see, I have them in beds and in pots. I cannot get enough of them. This pot will have months of interest too. I have narcissi following, then Tulipa 'Spring Green' and by the time the bulbs are over, the two grasses will have grown and have began to take over. Not much to say. Simple beauty, happy self seeder. I love it. It's not spring without Primula Vulgaris. 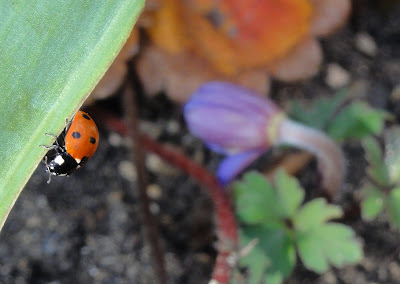 A seven-spotted lady bird appears to have done some chewing on the leaves of Tulipa turkestanica. These will start flowering in the next week or so, and usually last several weeks. I've got them growing with the strawberries, giving some interest in this part of the border whilst the strawberry plants get going. 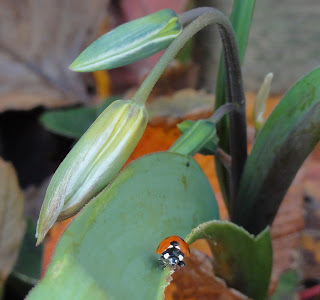 By the time the strawberry leaves grow and take over and their flowers come out, the Tulipa turkestanica will have died off and returned to the ground until next year. 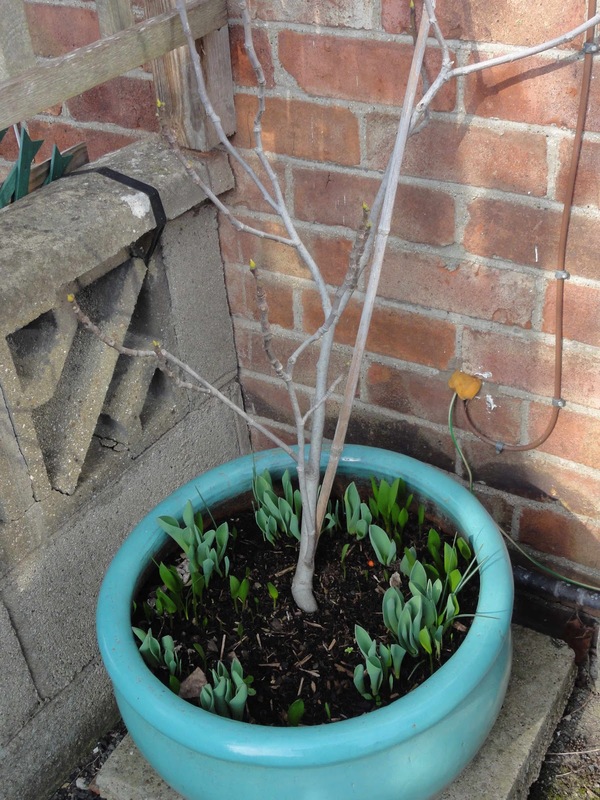 My potted fig has Fritillaria acmopetala coming up, along with Tulip Queen of the Night. Both have maroon flowers (maroon and yellow/cream in the case of the fritillary) which I think complement the turquoise pot quite nicely. And again, by the time they die off the fig leaves will be coming out - which helps to hide the wiring behind the pot! I love the side view of the ladybird - such dainty legs. Coming up behind is Anemone blanda. I can see this year I'll be getting more flowers than last year, so they must be happy where I have planted them. I think if it is sunny tomorrow, this Crocus chrysanthus 'Cream Beauty' will open up fully. And finally, let's not forget the vegetables! A couple of the broad bean plants got hit by frost, but after cutting the damaged bits out, the rest look really healthy. And the garlic is also taking off. 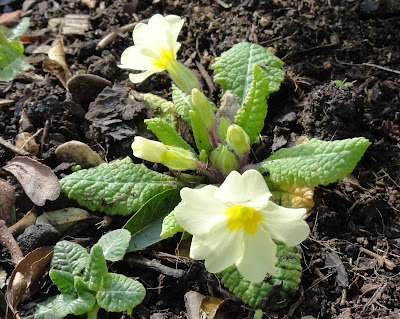 And see, more primroses. I also have crocosmia whose shoots will start coming up soon. 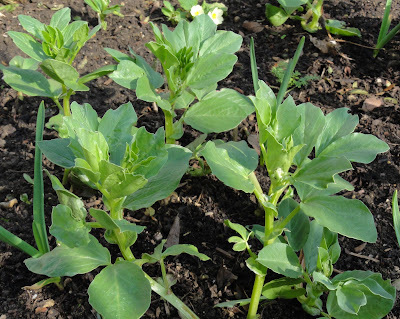 The flowers should be out just after the broad beans have been finished. I'll probably put in some lettuce after the broad beans to fill the gaps. Although the initial overview photo may have given the impression not much had changed in a month, on closer inspection you find lovely spring flowers, lady birds and vegetable growth. I wonder if the change will be more obvious by 1st April? Nice pictures. The Primula is one of my favourite flowers. glad to hear your flu has gone & yes Februarys weather was a pain!! I was down my plot last week (t-shirt & jeans) lovely sunny week, but the rains back today & the temperatures are down again?